AFL’s CS260-10 FTTx PON Activation and Troubleshooting OTDR enables cost-effective troubleshooting of FTTx PONs and point-to-point metro/access networks. CS260-10 includes 1625 nm Live PON OTDR providing 35 dB dynamic range, best-in-class 0.8 m event and 3.5 m attenuation dead zones, integrated PON power meter and Visual Fault Locator (VFL). The CS260-10 is purpose-built for optical network activation and troubleshooting tasks. With its integrated PON power meter, the CS260-10 enables verification of downstream 1490 and/or 1550 nm power levels at an FTTx PON ONU or ONT. If downstream signals are absent or power is too low, the CS260-10’s 1625 nm Live PON OTDR allows a technician to scan the network from the ONU/ONT or a network access point to locate fiber faults such as macro-bends, breaks, poor splices and dirty or damaged connectors. The live PON OTDR utilizes an out-of-band 1625 nm wavelength to prevent disrupting the 1310, 1490 and 1550 nm signals present on an in-service FTTx PON. 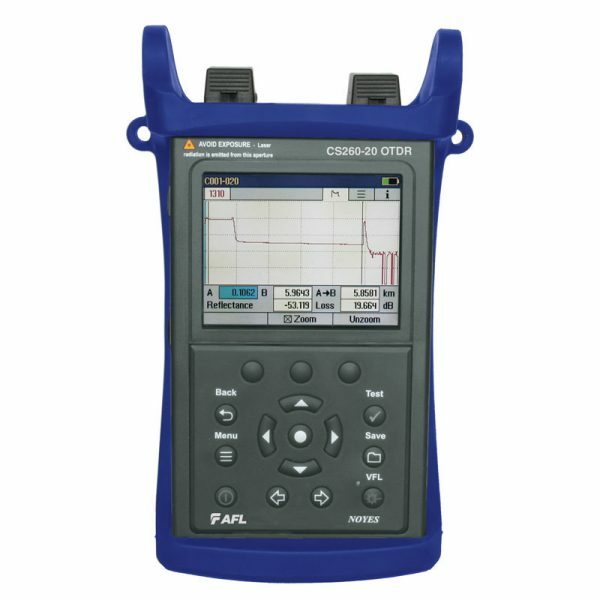 The CS260-10 is a derivative of AFL’s popular OFL280 and FLX380 FlexTester families, offering the same ease-of-use, high-contrast indoor/outdoor display and over 12 hours of continuous battery operation. It also includes an integrated VFL (visible red laser) designed to visually pinpoint the location of macro-bends or breaks in splice closures, access terminals and splitter cabinets. Over 1000 OTDR test results may be saved internally in industry-standard .SOR file format. Stored OTDR results may be transferred to PC via USB port for viewing, analysis, and professional report generation using included Windows® compatible TRM® 2.0 Basic Test Results Manager software. 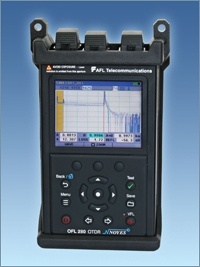 The CS260-10 includes rechargeable, replaceable Li-Ion battery pack, AC charger with country-specific power cord, user-specified adapters for the OTDR and VFL ports, dust caps for all ports, USB cable, TRM® 2.0 Basic Test Results Manager software, and a quick reference guide in any one of the supported languages. To further aid in locating faults within access points, splice closures or indoor cabling, the CS260-10 includes an integrated Visual Fault Locator (visible red laser). The CS260-10 is extremely easy to use. It provides fully automatic OTDR parameter selection, automatic event table generation, and end-to-end length, loss and ORL summary. For expert users, the CS260-10 also allows full control of OTDR parameters (range, pulse width, averaging time, etc. ).